NOTE: The conference proceedings were all in Spanish, except for translation for two English-speaking keynoters. 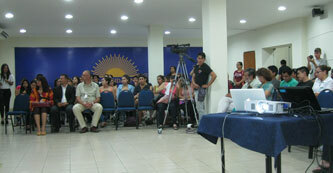 This report provides an outline of the conference in English. For more details, you can follow the main conference sessions in Spanish on video on YouTube through the links provided, although the sound quality is variable. This should allow those who understand Spanish to experience the conference in some detail. Links to presentations are also provided when available. 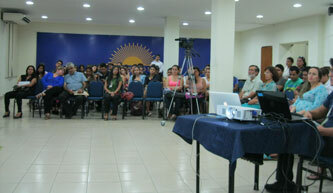 We hope that this will be useful to our members and friends in Latin America. With the launching of the United Nations 2030 Agenda and its Sustainable Development Goals approved at the UN General Assembly Summit last September, governments and the international community are heavily involved in implementation at the national level and in creating the relevant indicators and supporting measures. However, governments will not be able to reach these ambitious goals without widespread public support and involvement, and little has been done to make the SDGs accessible and relevant to the public. What has largely been a top-down process needs to be accompanied by a bottom-up process of public buy-in and participation. This conference explored implementing the SDGs as communities and individuals. Lifestyles are an obvious starting point, since they are individual as much as collective. A lot of work has gone into preparing the 10-year Framework of Programmes on Sustainable Consumption and Production, including its educational component, and a global network on Education for Sustainable Living has been set up. The challenge now is adaptation to local situations and implementation. Discussion under this issue included the use of the SDG framework to encourage responsible and sustainable lifestyles in individuals, families and neighbourhoods. Education is a cornerstone of the SDGs, both with its own goal and cutting across all the other goals. The fundamental transformation at all levels required by the SDGs will depend on strong motivation and changes in behaviour, and for this ethics and values are as important as information. Values-based education is an emerging area of practice with the potential to set youth on a path of responsibility and service. This issue provided an opportunity to share experience and to consider new directions. With Habitat III, the United Nations Conference on Housing and Sustainable Urban Development (https://www.habitat3.org/), being held in Quito, Ecuador, the week following the IEF conference on 17-20 October 2016, it was logical to consider the challenges of building sustainable urban communities. In many places, local governments have already taken the lead in transitioning towards sustainability. Beyond this, community-building depends on a number of neighbourhood processes including action, reflection, consultation and study that build trust and solidarity, and that empower a community to take charge of its own destiny. The SDGs can help to give communities a common vision and targets for a more just and sustainable future. The IEF 20th Conference provided an opportunity to dialogue and reflect about these elements of the SDG framework. What are the expectations, challenges and guidelines for achieving the progress needed? 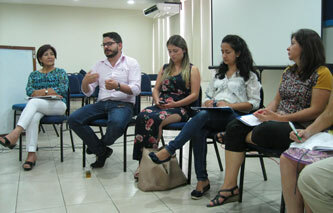 How to ensure social inclusion and participation? What are the implications for science, social action and policy? The Rector of Nur University, William Shoaie, opened the conference before a full auditorium of over 150 including many students, and welcomed the participants to this Baha’i-inspired university. 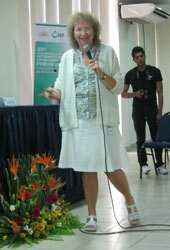 Griselda Torrico chaired the session and introduced the partners contributing to the conference: the International Environment Forum, the PERL/UNITWIN network based at Hedmark University of Applied Sciences (Norway) through which the Swedish Government provided travel support for some speakers, and Nur University. She explained the conference theme and its interest for the region. Arthur Dahl, President of IEF based in Geneva, Switzerland, gave the second opening keynote on “Looking at the Sustainable Development Goals from the bottom up”. He noted that the Sustainable Development Goals adopted at the UN Summit in September 2015 resulted from one of the widest consultation processes in UN history involving governments, UN agencies, the scientific community and civil society organizations, representing a global consensus on aspirational goals for the planet by 2030. However, successful achievement of the goals will require more than top-down action at the global and national levels. These are goals "of the people, by the people and for the people" so everyone needs to be involved, but little has yet been done to bring the SDGs to the public and to encourage universal participation in their implementation. This was the motivation for this IEF conference. He showed that there are many elements of the goals and targets that lend themselves to public involvement. At least 107 of the 169 targets under the goals can be implemented directly at the community level. Communities should prepare their own local Agenda 2030s with their specific SDGs, just as they prepared local Agenda 21s after the 1992 Rio Earth Summit. Individuals can also adopt their own SDGs with their individual targets for a responsible lifestyle of social justice, economic transformation and environmental sustainability. He shared a list of individual targets for the SDGs inspired by the global targets but suitable for everyone (TABLE). A written version of his paper with complete lists of community and individual targets is available, and his presentation can be downloaded. The evening concluded with questions to the speakers from the audience, available on YouTube at https://www.youtube.com/watch?v=tMG1rKWbDVc, followed by a reception. The remainder of the conference continued with a core of about twenty participants, which allowed for meaningful exchanges. The day began with two keynotes. The Rector of Nur University, William Shoaie, spoke on “Collective leadership as the basis for social transformation”, sharing experience from the implementation of the unique curriculum for development change agents at Nur University. Motivation comes from seeing the common good in what is collective, and developing capacities for collective action. Individual distinction comes from being a source of social good, bringing peace and well-being, happiness and goodness to our fellow human beings. Teachers can become agents for community change, and youth can be leaders. He described the “super powers” needed for moral leadership. Download his short presentation, and view the video on YouTube https://www.youtube.com/watch?v=12Stt3rZkwY (21:40). Victoria W. Thoresen, Director of the PERL/UNITWIN network at Hedmark University, Norway, and UNESCO Chair for Education about Responsible Living, addressed “The role of values, caring and creativity in achieving ‘the good life’ (buen vivir).” She wondered whether, just as quantum physicists hypothesize parallel universes, we were not experiencing parallel realities. On the one hand we see impending economic collapse, environmental destruction, inequality and individual despair. At the same time new technologies and social innovation are transforming society. Is the world just repeating cycles, or do we see a developing civilization on an upward spiral. The SDGs suggest that humanity can work together for a better future, but they are only a framework and we have to give them life. We need an ernest examination of our understanding of human nature and of our cultural frameworks, looking beyond the numbers of the public management paradigm to values and friendships. She then discussed each of the elements of her title. Values are the dynamic force for social change. But what are our values? What do we prioritize in our lives? Most people do not have words to discuss this issue. There is often a values or knowledge/action gap, between what we want to do and what we actually do. We need to look at our values through action and reflection, and see how they show in our daily life. Caring is not an easy subject to approach academically, but it is the power for change. Sustainable lifestyles are enabled by efficient infrastructure and individual choices and actions. Learning to care leads to constructive action, in how we organize our life, socialize, share, learn and educate. The UNEP stocktaking report “Pathways to Sustainable Lifestyles” showed that each region has different needs. PERL has produced values-learning toolkits, where students can learn to be stewards of the planet and to care for their communities, and LOLA - Looking for Likely Alternatives - on social innovation in communities. Creativity is needed to transform our inner life and outer conditions, helping us to become more fully human in a dynamic balance of the material and non-material sides of life. Friendships, collaboration, trust and compassion are non-material but important. We need to acquire an understanding of systems and processes, and gain insights into the interconnection of all things. We need to recognize that our understanding changes and grows, and that what we thought was right may not always be so. It is hard to reprogramme the habits of daily life, for which we need humility. This can inspire a capacity for service to foster a vibrant community with a keen sense of purpose. After some discussion with the public, the conference continued with a series of presented papers on the themes of Values and Education (SDG4), Sustainable Urban Communities (SDG11) and Responsible and Sustainable Lifestyles (SDG12). SDG 4 on Education includes reference to the 10 Year Framework of Programmes on Sustainable Consumption and Production (10YFP) approved at Rio+20 and incorporated into the targets under this goal. 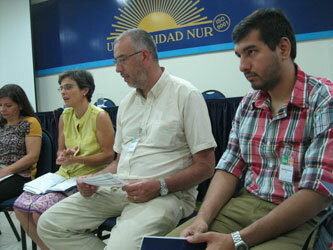 The speakers approached the issue from global, national and local perspectives, including both theory and practice. She was followed by Julio Mantilla of the Bolivian Ministry of Education, who shared his ministry’s programme of education for cohabitation of mother earth and community health. It incorporates scientific, productive, political and spiritual dimensions for living well in the community. There are components on the environment, climate change, resource management and community health, as well as intercultural, intercultural and multilingual dimensions. The ministry has produced manuals and training guides to implement this curriculum (presentation). He also made available a new set of in-service training materials for teachers on climate change risk management including disaster prevention and response in educational institutions, consisting of four training manuals (1, 2, 3, 4) and guides to floods, frost and snow, earthquakes and landslides, and drought and fires. 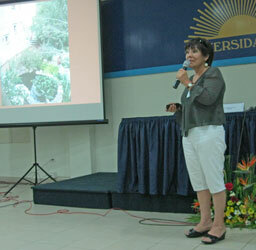 Juanita Hernandez described a conceptual model of environmental leadership. She started by analyzing present attitudes towards the environmental crisis, mostly of those either a part of the problem by contributing to environmental destruction, or at best a simple spectator, with few seeing themselves as part of the solution. Reasons for inaction include not knowing what to do, not feeling that doing something will make any difference, or denying that there is a problem. We are living in a time of transition in civilization, when a creative minority with a clear vision of the future can have a decisive influence once it reaches 2% of the population and creates a tipping point towards new behaviour. Building a transformative capacity involves developing capacities during cycles of learning, transforming mental models into conceptual models, motivation founded in principles and values, and achieving coherence and the ability to accompany others in service to the common good. Since people start with mental models acquired unconsciously in childhood and adolescence, rooted in habits and often containing contradictions, they need to be made conscious and questioned in order to replace them with newer conceptual models that are conscious, logical, coherent and evolutive. This means questioning common assumptions that human wellbeing is proportional to economic growth, that focus on short term benefits, that humanity is independent of nature which is there for its benefit, that there are ample resources and that nature can endure, that image determines worth, and that we are not responsible. 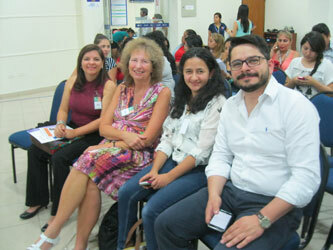 They were followed by Fabiana Méndez Raya, Director of the National Museum of Natural History of Bolivia, and one of the conference organisers for IEF. She spoke on the new role of museums to support building sustainability. The museum provides a space for exchanges and collaboration between scientists, communities and individuals on sustainable development and the natural heritage, integrating indigenous populations. It supports quality education both by going to schools and receiving classes at the museum. Patricia Vilchis Tella, Research Associate at the Stockholm Environment Institute (SEI) in Sweden, spoke on the SDGs and our lifestyle, with special reference to the 10YFP. SEI is interested in sustainable lifestyles and education, and is involved in multidisciplinary research and collaboration. It has prepared a background report on sustainable lifestyles, and has projects on sustainable cities, business investment and strategic communications. She described several research projects, with the aim of speeding up implementation over the next two years and increasing impact on policy-makers. Bringing things down to a very practical level, Cristina Arcos of Cochabamba, Bolivia, described the incentives and challenges that an individual family can face in the search for sustainability, using the example of an attempt to build a completely sustainable family house with bio-architecture, passive ventilation, solid and liquid waste recycling. 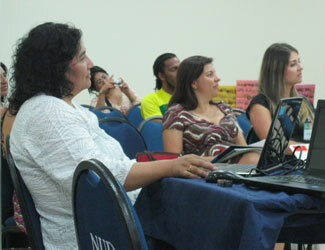 She described research needs, and the importance of government facilitation of personal initiatives. Johana Botero of the Academy of Innovation for Sustainability (AISO) in Colombia, described their work on sustainable entrepreneurship and green markets. As a member of OECD, Colombia agreed at the Paris Climate Conference to reduce its greenhouse gas emissions by 20% by 2030. This is captured in the Colombian Strategy for a Low-carbon Economy, the National Development Plan, and the National Plan for Green Markets. She was followed by Kenneth Ochoa, head of the Environmental Engineering programme at the Universidad de El Bosque, Bogota, Colombia. He first summarized some of the present challenges. We buy things we don’t need with money we don’t have to impress people we don’t like. Real GDP is growing faster than population, but 1.1 billion lack potable water, 7 million are killed annually by air pollution, 4-6 million tonnes of plastic enter the ocean each year, 30% of food is wasted while 800 million go hungry and 500 million are underweight. Resource extraction is still rising, so how do we decouple economic growth from environmental impact? Since many people in Bogota spend hours commuting in buses, his university offers classes by radio in the buses, making the city a campus. 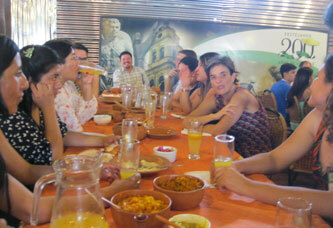 Eight courses in responsible consumption are offered, reaching 500,000 people. The courses create favourable conditions for economic, social and cultural transformation. The aim is not be be like others, but be what we are. After the presentation of all the papers, the conference was adjourned until Sunday morning. The aim of the first Sunday session was to allow a free-ranging consultation among all the participants, integrating across the different themes and exploring possible directions for the future. 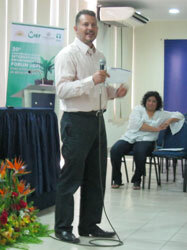 Javier Gonzales facilitated the discussions and ensured that everyone had a chance to contribute. The following discussion filled the morning, with frequent bursts of laughter at the recognition of widely-shared experiences and challenges. Common interests were identified, possible collaborations were explored, the specificities of Latin America emerged, and everyone felt that they emerged from the consultation enriched with new perspectives and visions of ways forward. View a video recording of the morning roundtable on YouTube at https://www.youtube.com/watch?v=MR2-LssFgQ8 (2:25:32). In the final session of the conference, the chair invited the representatives of the different collaborating organizations in the conference to make closing remarks. 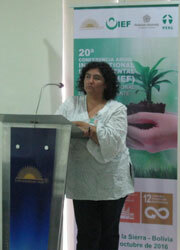 Isabel Martinez of UNEP highlighted the importance of interconnections and building links between efforts. She referred to the five priorities of the 2030 Agenda, and the need for values like trustworthiness and love to take them forward. She discussed some of the special challenges in Latin America in making the necessary transition, but step by step that change would be possible. It was necessary to find out what everyone is doing, and to work for a convergence on values and goals. There was a wide-ranging discussion on ways to carry these issues forward based on a shared vision and motivation. 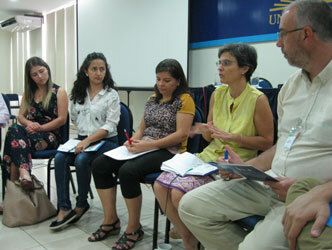 Alliances between governments and civil society organizations in Latin America needed to be strengthened. 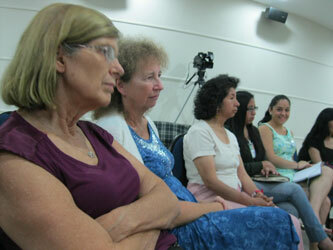 More could be done in teacher training and in producing materials for continuing education. 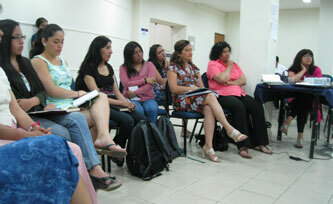 Participants considered how to continue working together, and what to do differently. More could be done on community participation, and holding meetings to encourage interactions. It was recommended that the results of this meeting be actively promoted. 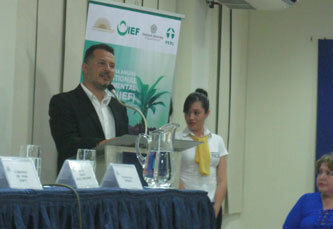 Arthur Dahl, President of the IEF, made some closing remarks. The International Environment Forum planned this conference to catalyze a process to bring the SDGs to the local level, with a bottom-up approach to complement the initiatives by governments and the United Nations. 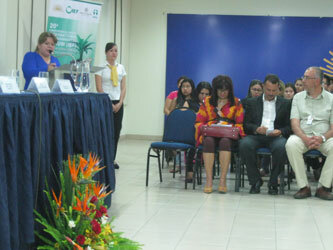 The conference recognized the importance of values in motivating change, in complement to scientific approaches. It was able to draw on the diversity of backgrounds, ages and experience represented among the participants. How exciting it was to see all the initiatives here in Latin America, in universities, museums, civil society organizations, communities and individuals, with so much practical experience on the ground to build on. You need to find ways to take this forward appropriate to your region, while IEF and other international organizations here will take it to the global level. The frequent laughter in the consultation showed how well you captured your shared experience in the spirit of the conference. Everyone contributed actively, and we hope that you have gotten all you wanted out of it. The wonderful gender balance showed that women are leading in this important area and have the strength and initiative to accomplish much more in the future. The IEF will try to capture the essence of this conference in the illustrated conference report on its web site (https://iefworld.org/conf20) in both English and Spanish, with links to the video recordings of the main sessions and to the presentations for those who want to go deeper. This will allow the many others who would like to have been here to share in the conference results. You can publicize this on your networks. We hope that we all can continue to walk on the path towards sustainability together. 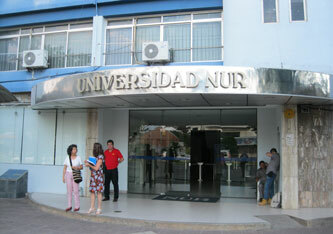 After expressions of thanks for all concerned, including Nur University for hosting the conference so well, the PERL/UNITWIN network, the Swedish Government for supporting the travel of some speakers, local IEF members Fabiana Mendez and Javier Gonzales and IEF President Arthur Dahl, the conference was closed. 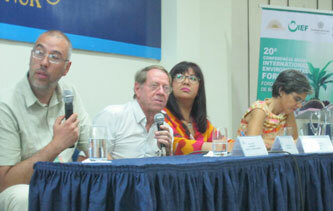 The conference was followed by the Annual General Assembly of the International Environment Forum (see separate report). TABLE - WHAT CAN YOU DO TO IMPLEMENT THE SUSTAINABLE DEVELOPMENT GOALS? Con la adopción de la Agenda 2030 para el Desarrollo Sostenible y sus 17 Objetivos de Desarrollo Sostenible (ODS) aprobada en la Cumbre de la Asamblea General de la ONU en septiembre pasado, los gobiernos y la comunidad internacional están fuertemente comprometidos en su implementación a nivel nacional y en la creación de los indicadores adecuados y las medidas que los respalden. Sin embargo, los gobiernos requerirán de un fuerte apoyo de la sociedad y su activa participación para alcanzar estos objetivos ambiciosos. Hasta el momento poco se ha hecho para que los ODS sean ampliamente conocidos por el público en general. Normalmente este tipo de procesos se han dado con un enfoque de arriba hacia abajo, sin embargo consideramos que ahora debe ir acompañada de un proceso de abajo hacia arriba con la apropiación y participación del público. Esta conferencia explorará la aplicación de las ODS en los individuos y comunidades. Los estilos de vida son un punto de partida más que interesante, ya que inicialmente son individuales pero a la vez colectivos. Un esfuerzo de 10 años se ha invertido en la preparación del marco para programas sobre consumo y producción sostenibles que ha incluido el componente educativo, y generado una red mundial de Educación para la Vida Sostenible. El desafío actual es la adaptación y la implementación a las realidades locales. Durante la conferencia discutiremos el uso del Marco de los Objetivos de Desarrollo Sostenible para fomentar los estilos de vida responsables y sostenibles en los individuos, las familias y vecindarios. La educación es la piedra angular de los ODS y cada uno (educación y ODS) con sus propias metas pero, a la vez, transversales con todos los objetivos de desarrollo sostenible. La transformación fundamental en todos los niveles requeridos por los ODS dependerá de una fuerte motivación y cambios en el comportamiento individual, y para ello la ética y los valores son tan importantes como la información. La educación basada en valores es un área emergente de la práctica, con el potencial para establecer en los jóvenes un camino de responsabilidad y servicio. Este enfoque, brindará la oportunidad de compartir las experiencias y considerar nuevas direcciones que seguir. Con la conferencia Hábitat III, sobre Vivienda y Desarrollo Urbano Sostenible (https://www.habitat3.org/), que se celebrarió en Quito, Ecuador, del 17 al 20 de octubre de 2016, resulta lógico considerar los desafíos que implicará la construcción de comunidades urbanas sostenibles. En muchos lugares, los gobiernos locales ya han tomado la delantera en la transición hacia la sostenibilidad. Más allá de esto, la creación de comunidades sostenibles depende de una serie de procesos conexos, incluyendo la acción, reflexión, consulta y estudio que permita desarrollar confianza, solidaridad, y autonomía para que cada comunidad pueda hacerse cargo de su propio destino. Los ODS pueden ayudar a dar a las comunidades una visión y objetivos comunes para un futuro más justo y sostenible. La 20va conferencia del IEF proporcionarió una oportunidad para dialogar y reflexionar sobre estos elementos en el marco de los Objetivos de Desarrollo Sostenible. ¿Cuáles son las expectativas, desafíos y directrices para alcanzar el progreso necesario? ¿Cómo garantizar la inclusión social y la participación? ¿Cuáles son las implicaciones para la ciencia, la acción social y política? La conferencia está co-patrocinada por la Red de Educación e Investigación para una Vida Responsable PERL/UNITWIN. Una vez adoptada la agenda 2030 para el desarrollo sostenible con sus 17 objetivos y sus 169 metas requieren de la acción de individuos y comunidades comprometidos con mejorar la situación del mundo. Una reflexión sobre el impacto de la Educación Ambiental en América Latina y el Caribe, dejó la percepción de que posiblemente estaríamos en una situación más alarmante sí es que no se hubiera llevado a cabo un proceso de educación, sin embargo un aspecto importante para el desarrollo de la agenda será el nuevo rol de la educación ambiental integradora que ayude a generar sociedades e individuos más responsables y con diferentes valores que permitan vivir en el planeta de manera sostenible. La presentación de Arthur Dahl sirvió para esclarecer las orientaciones del texto de ODS´s sobre qué hacer, como individuos para ayudar a los gobiernos y Estados a alcanzar las metas de desarrollo sostenible fueron propuestas, como un aporte a las múltiples tareas y desafíos que se tienen como humanidad fueron expuestos y distribuidos. El énfasis en que los individuos debemos actuar ayudando a nuestros gobiernos y estados a cumplir con las metas asumidas considerando que en general los gobiernos no pueden hacer todo lo prometido si no cuentan con una ciudadanía comprometida. Durante la 2da sesión se realizaron varias presentaciones que mostraron muchas de las iniciativas que diversas organizaciones en Bolivia y en otros países de Latinoamérica están llevando a cabo para contribuir a las metas de desarrollo sostenible, se tuvieron 3 temas de trabajo Educación de Calidad, Comunidades Urbanas sostenible y Estilos de vida responsables. La sesión inició con la presentación de Victoria Thorensen quien hablo sobre la importancia de los valores, el cuidado y la creatividad en el vivir bien, y la importancia de los mismo en la transición a la sustentabilidad, el cuestionamiento de nuestro valores y la reflexión sobre las prioridades en nuestra vida y las dicotomías que se dan entre lo que decimos creer y cómo actuamos en nuestra cotidianidad. Las implicaciones de este hecho en nuestras acciones y comportamientos de consumo y producción podrían generar grandes cambios, y llevarnos a un proceso continuo de aprendizaje y reflexión. El cuidado y la creatividad pueden ayudar a que la sociedad pueda transformarse hacia estilos de vida sustentables. William Shoaie, rector de la Universidad Nur complementando la charla inicio la presentación de liderazgo colectivo como base para la transformación, mostrando las experiencias de la universidad en 3 proyectos: UNIRSE, Liderazgo Juvenil, Maestros como agentes de desarrollo comunitario. UNIRSE, como una experiencia continua desde el inicio de la universidad Nur, ha logrado cambios sostenidos en el tiempo basado en la motivación por generar bien común, apoyando al desarrollo de las capacidades y la acción colectiva. Posteriormente varios de los asistentes pudieron compartir sus experiencias y reflexiones sobre los objetivos de desarrollo sostenible y mostraron cómo desde sus actividades, proyectos y acciones contribuyen o podrían contribuir a alcanzar los objetivos de desarrollo sostenible desde los ámbitos locales y regionales. Destacar que todas las iniciativas de las diferentes organizaciones en sus respectivos campos de acción nos muestran que los esfuerzos están orientados a una visión común dada por los objetivos de desarrollo sustentable, evidentemente los esfuerzos que se requieren son grandes y siempre quedará más por hacer en este proceso. Algunos elementos que deben destacarse de las presentaciones y discusiones/consulta realizada por los participantes es que a nivel individual se debe resaltar la importancia de los valores, la creatividad e interés por el cuidado del otro, la perseverancia y muchos otros valores más que de seguro iremos reconociendo y haciéndolos evidentes a medida que nuestro proceso de aprendizaje vaya siendo más fuerte. Desde la perspectiva de comunidad tenemos el reto de generar un entramado más robusto, relaciones que fortalezcan a la colectividad, el hecho de promover liderazgo colectivo basado en el servicio a la comunidad, en la creencia de la nobleza del ser humano, seguido de otros principios demostrados con las experiencias presentadas en este foro, ayudarán a generar comunidades robustas, que confíen en sus individuos e instituciones generando bienestar y prosperidad para los individuos. Una de las conclusiones a la que podemos llegar luego de haber escuchado todas las experiencias es que cualquier proceso de transformación y desarrollo requiere de espacios y momentos motivadores o estimulantes que ayuden a generar acciones y hechos que pueden ser educativos, detonando emociones, ayudando a promover estilos de vida responsables y comunidades sostenibles. Un aspecto que fue compartido por la mayoría fue el desafío que presenta mucha sensibilidad y es el mantener el ímpetu (perseverancia con la misma motivación) a lo largo del tiempo cuando se está realizando cualquier tipo de intervención en uno o varios objetivos de desarrollo sostenible, y cómo o cuál es la conexión entre las iniciativas individuales y los sistemas colectivos. TABLA - ¿Qué puedo hacer yo para ayudar a alcanzar los objetivos de desarrollo sostenible?